Register for the Powerloop vehicle-to-grid (V2G) leasing bundle today. This is your chance to join the electric car revolution and help prove the value of large-scale domestic V2G charging. By choosing Powerloop, we'll lease you a brand new Nissan Leaf - WhatCar? ‘Best Electric Car 2018’- plus you could earn up to £30 a month with the bundle. 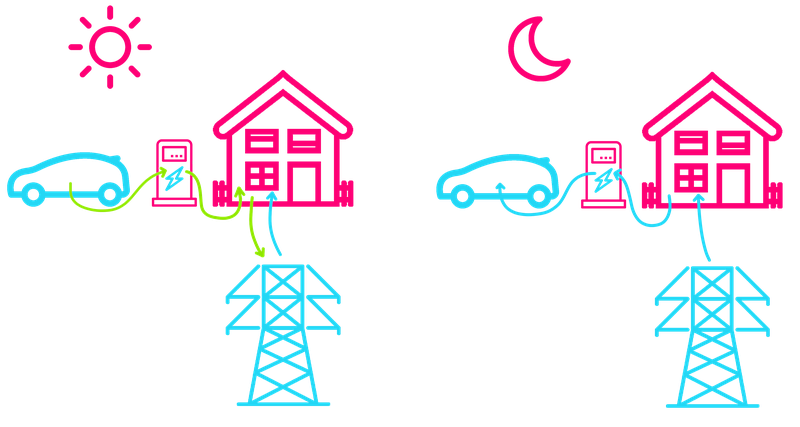 Our V2G system will optimise the use of your car's battery everyday; powering your home - and your neighbours homes - when electricity demand is high, then charging back up at times when electricity demand is low. By unlocking the potential of your cars battery, we can also help support a more renewable grid. The wind doesn't always blow, and the sun doesn't always shine, when we want it to. But by utilising V2G we can shift charging patterns to make more use of renewable energy when it's available. For example, when there's an excess of wind power late at night, instead of it all going to waste we can store it in car battery for use the following day. Finally, you'll be helping reduce strain on your local network. Once peak demand is over each evening, your car will recharge overnight and be ready for you to hit the road in the morning. Pre-register now and you can be one of the first drivers to take advantage of the potential of V2G charging. A lease agreement of a new Nissan Leaf - WhatCar? ‘Best Electric Car 2018’. A V2G compatible charger (for free). 100% renewable electricity for your home and car from Octopus Energy. A Secure(TM) smart meter installed free of charge (if you don't already have one). An app to control the car's charging profile, and the minimum battery charge required. Dedicated Powerloop customer support line. V2G lets you use the electricity in your car to power your home, effectively taking it off grid. We're particularly interested in the hours of peak demand, which run between 4pm - 7pm each day. We can also use your battery to export electricity back to the grid, helping balance and reduce loads on the local electricity network for you and your neighbours. Help power up the grid this way, and we'll reward you with up to £30 off your lease, every single month. We won't let the amount of charge in your battery go between a lower limit, which you can select in our V2G app. You can ensure there's enough for life's little emergencies, and be confident your car will charge up overnight and you'll be ready to hit the road the next morning. Schedule the charging profile of your car; tell us when you leave each morning, and we'll make sure you have enough juice. Set minimum charge limits, so you're always ready for short trips. Override V2G and get your car to maximum charge for unplanned journeys. There's a lot of concern in the industry. More electric cars means more demand on the grid, and reinforcement costs could reach around £17bn by 2050. But what if electric cars were actually the solution? Since electricity can't be easily stored, the challenge is supplying enough to every home and business when they need it. Particularly at peak times between 4pm - 7pm when demand is at its highest. Plug in your car, and we can transfer excess power back to the grid when it's needed the most; helping balance out the peaks and troughs in local demand. We'll install a charger in your driveway or garage. UKPN own and maintain electricity cables and lines across London, the South East and East of England. As our consortium partner, our aim is to demonstrate the value of performing V2G within their network. Eventually, we'd like to roll out this system across the whole of the UK, but that's unlikely to happen during the initial trial period. If you're not in the UKPN area - which you can check online here - it's still worth signing up, as we may have other new and innovative products you can try! We need to be able to measure how much electricity you use, and how much you export back to the grid. If you're not already an Octopus customer, we'll sign you up for 100% renewable energy with the Powerloop bundle. If you don't have a smart meter, or have one that we're not able to communicate with, we'll install one for free. How soon will I be able to take part? At the moment we’re finding out who would like to be involved, as well as finalising details behind the scenes. Sign up now, and you’ll be one of the first to know when we move on to the next stage of leasing cars and installing V2G chargers. What if I can’t plug in by 6pm three times a week? Charges are actually measured over the course of a month, so we’ll expect you to plug in before 6pm at least 12 times each month. If you tend to still be on the road at this time, this probably isn’t right for you. We have accounted for a few weeks of holiday, when your car might not be at home, but we’ll get in contact with you if we see a consistent lack of charging over time. Will V2G affect my warranty? We’ll be working very closely with Nissan to make sure we don’t exceed any of their warranty limits. Based on similar projects involving Nissan, the maximum value is likely to be somewhere in the region of 16.2 kW a day, five days of the week. Why do I need to be an Octopus Energy smart meter customer? We need access to half-hourly reads from your meter, and a smart meter is the only type capable of this. Currently, our system infrastructure is built around the systems provided by Secure metering, which means we’re not able to integrate with other systems, such as CGI or British Gas (although this may change in the future). If you do want V2G, we will replace any current smart meter with a Secure smart meter, free of charge. Innovate UK is the operating name of the Technology Strategy Board, the UK's innovation agency. It is a UK non-departmental public body operating separately from the Government but reporting to the Department for Business, Energy and Industrial Strategy (BEIS). Innovate UK is now part of UK Research and Innovation. Who is part of the Powerloop Consortium? The consortium includes ChargePoint Services, Energy Saving Trust, Navigant, Octopus Energy, Octopus Electric Vehicles, Open Energi, and UK Power Networks. We represent a huge breadth and depth of experience across the energy industry. What if I move home, or switch away from Octopus during the lease term? You have to be an Octopus Energy customer to enjoy the Powerloop benefits. But if you move home, we may be able to relocate the charger. If we’re not able to do that, we will remove the charger from the property. If you want to switch from Octopus Energy but are not moving home, we will remove the V2G charger but can quote on the installation of another smart charger. You can then continue to lease the Nissan Leaf if you want to. What happens if I want to cancel my lease? This will be subject to the standard terms and conditions of your lease. Again, we will remove the V2G charger in this case. What if I have solar, some other microgeneration, or a home storage battery? These systems should continue to work as normal if a V2G charger is installed. However, the way each is setup, and the way each interacts with a smart meter, can be quite complex. Because of this, if you are selected for the trial, we'll ensure we fully understand how everything in your home works before undertaking any installation. * How did you calculate a £30 saving would be equivalent of over 11,000 miles? In early Sep 2018, the Flexible Octopus tariff electricity unit rate is 14.6p/kWh in a typical UK Power Networks region (where we're initially offering the Powerloop bundle). Therefore, £30 per month is the equivalent of 205 kWh of renewable electricity. A Nissan Leaf will typically do around 4.5 miles/kWh - sometimes more, sometime less depending on your driving. This means that the 205 kWh every month is the equivalent of 922 miles every month, which is over 11,000 miles every year. The estimated average annual mileage per car in England is 7,800 miles in 2017 (source: The Department for Transport’s National Travel Survey, 2017). ** Why are you only using the Nissan Leaf? It's currently the only fully electric battery powered car with the technology capable of supporting V2G. The Mitubishi Outlander PHEV (plugin-hybrid electric vehicle) is also capable of V2G, but only has a 12 kWh battery. That's not enough capacity for us make this work. We also prefer to work with cars that are 100% emission free while driving. Until other manufacturers choose to make their vehicles V2G capable, we'll only be able to use the Leaf. We are keeping a close eye on what the industry, and by signing up we'll let you know if this changes at any point. If the bundle proves successful, then we'll be in a great position to show vehicle manufacturers that it's worthwhile!